In chess, it’s all about capturing the King. Imagine this: You’ve lost the Battle of Worcester, and your soldiers have been killed, captured, and/or scattered. You know what comes next. Your father, after all, was murdered at the hands of the very men who are scrambling to find you. Resources? 200 mounted men. Options? Run. Following the battle, Charles headed north toward Scotland. Not that he wanted to, and you could hardly blame him. Since June 1650 when he landed in Scotland to secure an alliance, the Scots had practically kept him a prisoner. He acted the part of a puppet king with his strings held by the Scottish Kirk and the play, the Covenanter King. Somewhere between their first stop at Ombersley (six miles north of Worcester) and Kidderminster (another seven miles), Charles and his advisors reached consensus to allow the rest of the two hundred “beaten men” to strike for Scotland via the Lancashire road while they slipped away. Charles and this smaller party of sixty men continued on to Kinver, and there rested for a few hours to regroup and form a game plan. 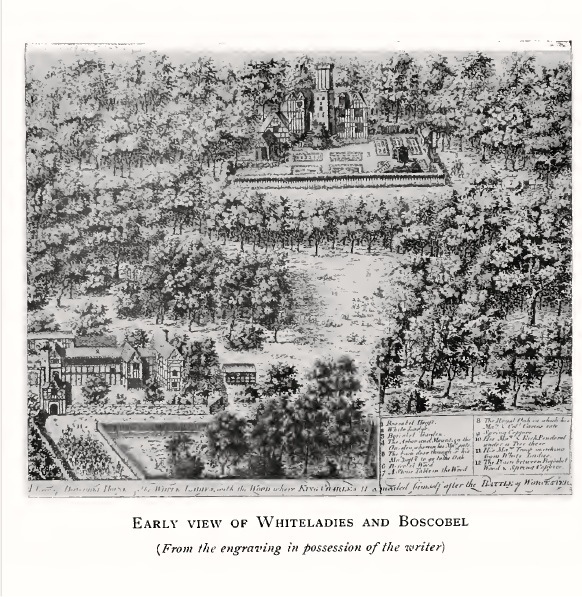 One of the advisors, Lord Derby, had previously escaped Cromwell’s army and hid at Boscobel House in Staffordshire, a hunting lodge owned by the Giffard family. By good fortune (or Providence), the company included Major Charles Giffard, a connection of these same Giffards. Dawn was fast approaching, and the company realized they didn’t have time to make Boscobel before the sun rose. Major Giffard led them instead to White Ladies, another holding of the Giffards. The Giffards were not at home, but their servants, the Penderells, managed the property in their absence. George Penderell, the youngest of the Penderell brothers, answered the door. Imagine poor George standing in his nightclothes struck speechless at finding Charles Stuart and sixty of his closest friends on his doorstep. Fortunately for George, he didn’t have to sort this out on his own. His older brother, John, and sister-in-law were on hand. After the initial shock, they sent a young lad, Bart Martin, to Boscobel for their eldest brother, William, the caretaker of Boscobel House. Another brother, Richard (aka Trusty Richard), was also fetched from his home at Hobbel Grange. A fifth brother, Humphrey, completed the set. Meanwhile, Goodwife Penderell served the weary King and his companions biscuits and sack. After a few hours rest, news came that one of the King’s generals, David Leslie, was sighted in the area with three thousand horse. The companions pressed the King to join Leslie, but Charles resisted, saying, “The men who had deserted me when they were in good order, would never stand to me when they have been beaten.” It’s very likely he didn’t trust Leslie after the general failed to commit his men during the battle. Charles decided to stay with the Penderells while the others prepared to ride out and join Leslie’s men. No one, except his close friend Lord Wilmot, knew that Charles intended to strike for London. Wilmot intended to head for London separately, and they both agreed to meet at the Three Cranes in the Vintry. Now Charles needed to fit in with his new companions, so the transformation of king to commoner began. The Penderells cut his hair, darkened his skin with a rubbing of (either) walnut or soot and exchanged his royal clothes for a coarse noggin shirt, a green suit and leather doublet. The decision to place his fate in the hands of servants instead of lords would prove to be fortuitous. Leslie’s three thousand horse along with the King’s former companions who had left White Ladies earlier that day were later captured near Tong Castle. As Leslie’s men were being rounded up, Charles hid in Spring Coppice with Trusty Richard. While hanging out in the drizzle, Charles realized that he would not be able to reach London safely. The Penderells had contacts but none lay toward London. His best option was to cross into Wales and make for the nearest port town where a ship could then be found. That night, Charles and Trusty Richard set out on foot to the ferry, intending to cross the Severn into Wales half-way between Bridgenorth and Shrewsbury. Around midnight, they came upon a mill with the miller standing in the doorway, visible in the dark by his white shirt. Trusty Richard warned Charles not to speak, as he didn’t have the manners or accents of a country fellow. “Who goes there?” the miller demanded. “Neighbours going home,” Richard said. Richard and Charles dashed for the gate leading to a “dirty lane up a hill.” The miller screamed, “Rogues! Rogues!” and men ran out of the mill to investigate. Not knowing if they were soldiers, the pair dove over a hedge and hid in a ditch. They waited for half an hour to make sure they weren’t being chased. The evening went downhill from there. It turned out that two companies of militiamen were guarding the ferry crossings. Charles and Trusty Richard had no choice than to give up on Wales. Discouraged, they arrived at Boscobel House where eldest brother William hid yet another Worcester fugitive, Major Careless. It wasn’t considered safe for Charles or Careless to stay in the house. The patrols were roaming the area, and William felt they would naturally search the hunting lodge. Their solution: hide in an oak tree. Mind you this wasn’t just any oak. In later years, it was known as the famous Royal Oak. But at this time, it was a very large, and at the top, a very lush tree, thanks to all the years that William pruned it diligently. Up the tree they went, with a basket of bread, cheese and small beer. During the day, enemy patrols made a search of the thicket and even passed right under our famous oak tree. Had they looked up, it would have been checkmate. Rather than continuing to test Charles’s extraordinary luck, the next day the Penderells led Charles to his next safe house, Moseley Old Hall in Wolverhampton, the home of Sir Thomas Whitgreave. What happened to our Penderells you ask? I’m happy to report that Charles did not forget them. When he finally regained his throne in 1660, he granted the Penderells an annual pension. Trusty Richard received £200 p.a, and to his descendants £100 p.a in perpetuity. If there is a Penderell out there still receiving their pension, I’d love to hear from you! The next instalment of Finding the Fugitive King follows Charles to Wolverhampton. This entry was posted in 17th century and tagged Battle, Boscobel House, Charles Stuart, English Civil War, Escape of King Charles II, Oliver Cromwell, Penderell, Royal Oak, White Ladies, Worcester. Bookmark the permalink. Wonderful post, thank you, Cryssa! I visited Boscobel a couple of months ago and thought it was an enchanting and very atmospheric place. Wow, I knew he hid in a tree but he must have had luck on his side. Definitely, Linda. He had more than his share of luck and drew from that well repeatedly over the next 6 weeks. The Penderells do indeed receive their annuities to this day. I’d love to hear from them as well! Recently, I visited the Banqueting House where Charles I was executed and it brings home the imperative of his son’s escape from Boscobel the following year. To picture the dignified king, stepping out onto that balcony on a cold January day, knowing it would be his last sight of his people is chilling for more than the winter weather. The adventure of escaping his father’s fate with the assistance of the common people invoked a covenant between king and his people that Charles II never forgot. No monarch since Henry VIII or Elizabeth I so fully understood this imperative. To protect the king and serve the people is the trust between a monarch and his subjects that builds the foundation on which the crown stands. Charles II lived and ruled with this trust clearly in mind. He may have been the chess piece to be preserved at all costs, but the pawns had the most to lose. And without them, he was king of naught. Love the analogy Sally! The pawns had a great deal to lose and did not have the benefit of status to shield them. The Banqueting House is an impressive place. I believe it had the only collection of Rubens on display outside a museum. Ironically Charles I commissioned them to commemorate his father’s monarchy and highlight the King’s divine right to rule. Cryssa, this is all so fascinating. I was familiar with some of these names but not with their deeds. Learning lots from you:). Loving these posts, Cryssa! When is the next installment? Can’t wait to hear more of your perspective on Charles’ royal road to Merry Monarch.